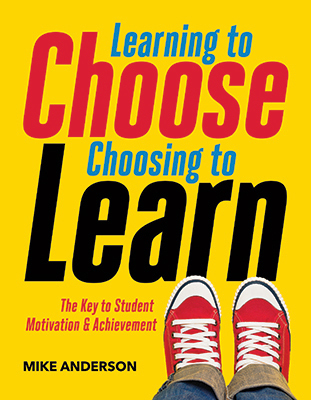 Offering students choices about their learning is one of the most powerful ways teachers can boost student learning, and this chapter will dig into why this is the case. You'll learn about why choice can help increase intrinsic motivation and how that can affect student learning. You'll also learn about many other benefits of using choice as a part of daily teaching. Students learn more when they are motivated. I know this isn't exactly an earth-shaking statement. We all know from experience that when students have energy and passion for their work and are driven to excel, they can accomplish incredible feats. I also know that all students are motivated. However, like my son Ethan, students aren't always motivated to do the school work that's in front of them. Sometimes, the learning task is so easy that it is boring or so hard that it is overly daunting. Or it may be that the learning doesn't seem to have any personal relevance or doesn't connect with a student's strengths or interests. When choice is used well, it can help overcome both of these common classroom challenges. Four students are hunkered down together in beanbag chairs, exploring character analysis through books they have chosen. Although all in 5th grade, their books represent a wide range of reading levels: Harry Potter and the Sorcerer's Stone, Stuart Little, Jennifer Murdley's Toad, and Eragon. All students take notes as they read independently, preparing for a group discussion they will have at the end of the period. A chemistry class is learning about the Ideal Gas Law. The teacher has taught a focused 10-minute lesson, and students are now solving problems in which they apply this law. They have a variety of problems from which to choose as they practice the skill—some are quite basic, some are more moderately challenging, and some are very difficult. Although students choose which problems to solve, they help each other as they work, supporting each other, and deepening their own understanding through collaboration. In both of the above scenes, students of varying abilities and skill levels are working together. One of the great challenges of teaching is differentiating instruction for students—creating learning experiences that reach all of the learners in a heterogeneous group. (And let's be clear—all groups are heterogeneous. Ability grouping and tracking only create heterogeneous groups with a narrower range. There will be variations in skills and experience in any group.) We can feel overwhelmed by differentiation, thinking that we should create multiple learning experiences for any given group in order to meet everyone's needs. The idea of teaching four different lessons and structuring multiple activities for a given class is enough to make many teachers not attempt differentiation in the first place. One of the main purposes of choice is to provide a few options for students and have them self-differentiate. In the reading example above, all students have chosen their books carefully. Each book had to be at an appropriate reading level so they could read it fluently. It also had to be fictional, so they could examine character development, which was the main goal of the learning experience. In the science example, the teacher provided a set of problems to solve that represent a wide range of difficulty and complexity. Students were challenged to find problems hard enough to provide some challenge, but not so difficult as to be overwhelming. Because they're all working on problems involving the Ideal Gas Law, they can support and coach each other, even as they work on different problems. Understanding why this is so important requires us to examine a fundamental idea about human motivation. Finding an appropriate challenge. It takes me a long time to pick out a new crossword puzzle book. Standing in Barnes & Noble, faced with several shelves of options, I am overwhelmed. I flip through book after book, scanning the puzzles and clues, searching for a certain difficulty level. If the puzzles have few clues and it looks like I'll know the answers with little effort, the book goes back on the shelf—it's too easy to be any fun. Clues that are so hard that I don't even know what they mean are just as much of a turn-off. They're too difficult. Like Goldilocks looking for the perfect bed, I want one that's juuust right. I'm also both proud and embarrassed to reveal that as of the writing of this chapter, I am currently stuck on level 245 of Candy Crush. I'm far from alone. Though there may be many reasons that games like Candy Crush (or Bejeweled, Angry Birds, or even Pac-Man—if you can remember back that far) are so addictive, one feature is that they are leveled. They are easy to learn and provide quick success and then become more and more challenging as you progress through the game. This added level of challenge is, in part, what makes them so fun. If they were too easy, you'd get bored and quit. If they were too hard, you would get overly frustrated and quit. This place of ideal challenge has been called by many the Goldilocks Zone. In the early 1900s a Russian psychologist had another term for this—one that might take you back to your undergraduate days in education or psychology classes. The zone of proximal development. Lev Vygotsky theorized that there is a place for every learner in any given domain between their current level of independence and their potential for development within that domain. He termed this space the "zone of proximal development" and asserted that in this space, collaboration and coaching, either by a peer or teacher, will help bring the learner closer to their potential (Moll, 1990). There are a couple of important ideas to understand about the zone of proximal development in order to truly appreciate its connection with student choice (see Figure 1.1). First, this is the sweet spot where significant cognitive growth can happen. Students learn most when appropriately challenged, so offering choices that help get students in this zone will help students learn more. There is another less discussed but just as powerful connection between the zone of proximal development and choice. In this zone, learning is most enjoyable. Whether it's a crossword puzzle, video game, math puzzle, or science exploration, the right amount of challenge—that place where the distance between where we are and where we're trying to get is challenging and surmountable—is motivating. In their book Visible Learning and the Science of How We Learn, John Hattie and Gregory Yates explain that "we are motivated by knowledge gaps, but put off by knowledge chasms" (2014, p. 6). In his best-selling book about human motivation, Drive (2009), Dan Pink asserts that one of the key drivers of human motivation is a sense of mastery—it feels good to learn and grow. When a task is appropriately challenging, and students meet with success, a job well done and the completion of the challenge is positive reinforcement for the work itself. Because this zone is where learning is most pleasurable, when teachers empower students to choose elements of their work, they tend to settle into this zone on their own. They know their own abilities better than teachers ever can and want to be engaged in appropriately challenging work, so they will self-differentiate when conditions are right. These conditions—a safe environment, a true sense of ownership of work, and understanding themselves as learners—are the focus of Section II of this book. Excessive frustration leads to disengagement. Learning is appropriately challenging (zone of proximal development). Joyful challenge leads to high engagement. Excessive boredom leads to disengagement. Of course, students vary in ways other than their skills and abilities. In any given class, you will have students with a wide range of interests and passions. Some students are interested in nature, others history, others sports. Some students love working with others while some prefer to work on their own. Craft projects and artwork may be appealing to some, and computer and technology may be preferred by others. When you can tap into students' interests and passions, they will be more joyful and invested in their learning, and you're on your way to overcoming a second common challenge in schools: apathy. For many of us, this can be the greatest frustration of our work. We spend hours crafting lessons and creating units only to watch students' eyes glaze over and their heads drop. "Do we have to do this?" they groan. "These kids just don't care!" it's tempting to cry in frustration. Perhaps instead we should answer with a question of our own: "Why should they?" What does the learning in front of them have to do with them? How does it pique their interest or tap into their strengths? A reluctant writer who loves science fiction may be excited to write a Star Wars sequel. A student who is unenthusiastic about learning about the American Revolution but is excited to work with computers may be excited to put together a Prezi showcasing key causes of the war. A student who doesn't always love math but loves to play games may enjoy playing a simple game with dice and cards to practice working with fractions. Beyond simply connecting with interests, choice can help combat apathy in several other ways as well. The power of positive emotions. As a middle school student, I was convinced that I didn't like to read. The bulk of my reading experience in school involved assigned books or giant anthologies filled with short stories with questions at the end. Reading was about completing assignments, which I did compliantly with as little effort as possible. Then my 10th grade English teacher assigned a new kind of reading task: Choose a novel to read and share with the class. As a lifelong Red Sox fan, I'll always be a bit perplexed as to why I chose The Mick, Mickey Mantle's autobiography. I suppose that for a 15-year-old boy, it had everything I could wish for in a book—adventure, humor, bawdy behavior, and baseball. This is the first time I remember loving a school-related reading task, and 30 years later I still remember much about the book. Some may argue that feeling good about schoolwork isn't a good enough reason to structure work in a particular way, but as it turns out, positive emotions aren't as soft and unimportant as they may first appear. Brain research sheds light on some of the important connections between emotions and learning. Neurologist and educator Judy Willis makes the compelling case that the human brain is more available for learning when learning is joyful. She also points out that boredom and excessive frustration put the brain in stress-response mode, which effectively shuts down learning (2006). As Eric Jensen notes in Teaching with the Brain in Mind, "Teachers who help their students feel good about learning … are doing the very things the student brain craves" (2005, p. 77). In short, positive emotions pave the way for greater learning, and offering students choices about their learning is a powerful way you can help them feel good about their work. Intrinsic motivation flows from ownership. Many years ago I heard a fantastic author and presenter speak about the importance of student ownership of work. He shared a story about a 7th grade student who had produced a poor piece of writing on a standardized writing prompt. He asked the student why he had put in so little effort, and the response his student offered has informed how I think about motivation and learning. It was something akin to "That was a writing prompt. You made me do that. That was your work, not mine." The presenter then looked directly at us and challenged, "Think about your students' typical school day. How much of the day do they spend doing your work, and how much do they spend doing their work? And if they spend all day doing your work, how do they feel?" As Dan Pink says, "Control leads to compliance; autonomy leads to engagement" (2009, p. 108). Too often in schools, teachers own the work. We create and teach lessons, dole out assignments, and assess the results, leaving students feeling like worker bees, dutifully completing assigned tasks with little power or control. However, when we give choice, we both empower students and help them develop and take more responsibility for their own learning. An important shift in responsibility. The increased emphasis on differentiated instruction and the momentum of project-based learning and personalized learning highlight an important shift happening in education: the move toward a more student-centered approach to teaching and learning. Interestingly, this movement comes on the heels of the push toward standards and academic accountability that caused everyone to tighten their collective grips on what students did and how they did it. It's important to recognize that these two seemingly very different movements don't need to be at odds with one another; teachers should be able to personalize learning within the context of academic standards. It does, however, require that teachers shift their instructional strategies, and choice may be one of the best vehicles for getting there, for it allows teachers and students to share in the responsibility of teaching and learning. Teachers can create viable options that students will find compelling and appropriately challenging, and then students take responsibility for choosing options that will best help them learn. Through choice, you can help students self-differentiate their learning so work is more appropriately challenging. You can also combat student apathy, helping students connect with their strengths and interests and giving them more autonomy, power, and control over their work, which boosts their intrinsic motivation. These are perhaps the two most compelling reasons to use choice as a part of daily teaching and learning in schools, but there are many other additional benefits that are important to recognize as well, for they help highlight the true power and potential of choice. Students engage in deeper, richer learning. Students display more on-task behavior. Students' social and emotional learning increases. The learning environment becomes more collaborative. Students who are given choices about their learning can engage in higher-level learning for multiple reasons. For one thing, when students are more joyfully engaged, their brains are able to process learning and store it in long-range memory more effectively (Willis, 2006). It is perhaps not surprising that I remember a lot more about The Mick than I do The Red Badge of Courage. Research has also indicated that choice enhances creativity and leads to many other positive student work habits such as self-initiated revision and editing and better organization (Denton, 2005, p. 208). Also consider how much richer and more varied learning can be in a classroom when everyone isn't doing the same thing. If all students are reading the same book, for example, conversations about the topic will naturally be limited to that one text. In a classroom where students read three novels about a specific topic or theme, they'll have richer and more varied discussions because there are multiple texts to discuss. Steven Johnson, author of Where Good Ideas Come From, argues that great innovations are more likely to come from diverse environments. Cities are more likely than small towns to produce great innovations, simply because there are more people, engaged in different kinds of work, who can bump into each other and spark new thinking (2010b). Steve Jobs famously demanded common spaces that would lead to collaboration when the new Pixar studio was in the planning stages. He pushed for a large atrium, a communal space where people from various departments would mix and mingle, as well as centrally located bathrooms which would lead to spontaneous conversations at the sink (Schlender & Tetzeli, 2015, p. 315). I've seen the power of diverse work time and time again in my own classrooms. I remember Phoebe using a quadrama—a three-dimensional project that shows four scenes at once that she learned at Girl Scout camp—to share about a book she read. Several other students, inspired by her project, asked her how she constructed it, and within the next few weeks, multiple other students used quadramas to share books and present content in research projects. When all students are engaged in the same task in the same way, there is a limit to how far the work can go. The teacher and the task define the boundaries, and it's almost impossible to go beyond them. When you share more of the power and control with students, giving them more flexibility and choice about how they accomplish learning goals, suddenly everyone can inspire each other, spurring on new ideas and prompting more creativity. Judy Willis, prominent neurologist and middle school teacher, has noted that excessive boredom and frustration lead to the stress-response in the brain (2006). Students in this state are very likely to move into the classic "fight" (arguing back or erupting in anger), "flight" (wandering in the halls), or "freeze" (zoning out) mode. Research has shown that students with conditions such as ADHD and emotional disturbances that often lead to behavior problems have significant decreases in problem behaviors when they are given choices about what or how they learn (Denton, 2005, p. 209). Students come to school each day craving interesting and engaging work. When school work is purposeful, appropriately challenging, and personally interesting—all qualities that can be satisfied through appropriate choice—students' needs for engagement are met through the work, making them less likely to seek other sources of entertainment. This isn't to say that offering students choices about their learning will result in a perfectly behaved class. However, students will be less likely to escape to the bathroom, wander around the room, or text a buddy in another class if they are engaged in stimulating and purposeful work. There is a broad range of social and emotional competencies and skills that students need to learn in order to be successful in school and beyond. Students are better able to learn and practice many of these skills when engaged in learning activities in which they have some power and control and when they are joyful about their work. Though there are many such skills, several of which will be explored throughout this book, let's consider just a few for illustrative purposes. Grit. For many, the first association that comes to mind when they hear the word grit has to do with compliance under duress (think of gritting your teeth). I prefer to think of it instead as a state of persevering through challenges within the context of truly engaging work. For students to display grit, there must be a connection between hard work and interest, otherwise we're merely talking about compliance under duress. "But isn't it a reality that we all have to accomplish tasks we don't enjoy?" you might ask. Absolutely. There are many teacher tasks I don't cherish: Making tough phone calls to parents, attending certain committee meetings, and wiping down tables during flu season are just a few. However, because these tasks fall within a job I love, I can attend to them with care and attention. Similarly, students have better energy for citing sources in a research project, editing writing, or even practicing math facts or vocabulary words if it's in the context of work about which they truly care. A sense of power can give them the motivation needed to push through challenges. Social awareness. When students are working in ways that are personally relevant and allow for creativity and autonomy, students' various strengths, abilities, interests, and challenges come to the surface. Students can see that everyone is different and can begin to see schoolwork through a variety of lenses and perspectives, learning to work with diverse partners and practicing empathy for those who learn differently. Effective decision making. You can't practice responsibility without having some control. Being responsible, being independent, and making reasoned decisions are skills that many of students need to develop—ones that frequently surface in "skills for the 21st century" or "skills for the workplace" lists. Today's jobs and careers require people to accomplish tasks off-site with flexible hours without relying on a manager or boss to direct every aspect of the work. When students practice how to make effective choices on a regular basis in school, they develop stronger decision-making skills. They grow in their ability to be self-reflective, thoughtful, and responsible people who can advocate for themselves and make appropriate decisions based on a wide variety of criteria. When all students are doing the same thing at the same time, students are more likely to view each other as competitors. Who can finish first? Who can get the most answers right? Who can create the best map or graph? It's almost impossible for students not to compare their work with those who are nearby when the task is the same. (This is true for learners of any age, by the way. Consider how self-conscious you may be of your own reading speed when you are with a group of colleagues reading an article in a professional development setting.) And once, as a learner, you start judging your own work based on the work of those around you, you have just taken your eye off the ball. You're no longer focused on the learning task at hand, but instead are paying attention to everyone else. Additionally, if you are now competing with classmates, their loss is as good as your win. "Don't look at my paper!" or "Ms. Costa! Lisa's cheating!" suddenly ring through the room as students view each other as competitors not collaborators. One of the wonderful benefits of choice is that as the work becomes more diverse, it's harder to compare the apples with the oranges. For example, a class is practicing multiplying fractions, but instead of everyone using the same workbook page, students are making up their own problems. As they work, they chat and share problems they're working on, even helping each other as they go. Because the problems are all different and there are several algorithms students may choose to solve the problems, some students are completing more problems than others, and problems all reflect a variety of challenge and complexity. Students are less likely to worry about competing with each other because they're all concentrating on their own work. This allows them to relax, focus on their work, and even be more supportive of each other. Will some students still compete with each other—vying to see who can create the most challenging problem? Probably. And this sort of competition is more likely to be healthy, because it is likely to be mutual and self-induced. As a general rule, the room will have a more positive, collaborative, and supportive tone as the work becomes more varied and diverse. This topic may be placed toward the end of this chapter, but it is far from the least powerful benefit. Teaching is one of the most stressful professions (Anderson, 2010, pp. 4–5), and in the past two decades it has seemed to get worse and worse. The pressures to teach to standardized tests and deal with unrealistic curricular demands make it easy to lose sight of why most of us entered the profession in the first place: We enjoy teaching. There's something truly remarkable, even magical, about being part of the learning process. When students have those light bulb moments or when they become so engrossed in an activity that they lose track of time, it is truly joyful to be a teacher. Having some power and control over work isn't just important for students. Autonomy is a critical component in our sense of positive connection to the profession and energy for teaching as well (Pearson & Moomaw, 2005). Through finding even simple ways to offer students some choices about their learning, we fire up our own creative engines, reigniting our passion and love for teaching. In addition to being more creative as we plan, we also enjoy the teaching itself more. After all, when students are more engaged, have more fun, and learn more, we have more fun as well. As I've worked with many different teachers to help them bring more choice to their students, I've heard a common refrain: "This is so much fun. My students aren't the only ones who are enjoying class more!" Here's one final idea to keep in mind: Choice is most powerful when used with purpose. It can be easy to fall into the false line of thinking, "If choice is such a great strategy, then everything should involve choice." Like any other effective strategy, it isn't always the best one to use. It all depends on your goals. For example, perhaps you want to expose all students to a specific strategy or project so it can become a choice later in the year. In this case, there are no choices because there really is just one option. Or perhaps you are creating book groups based on very specific reading skills that students need. In this case, students might choose in a way that won't allow them to work on the skill you are targeting—you should create the groups and not offer choice. After all, it's important to remember that choice is a means to an end not an end in and of itself!